RANGOON, BURMA (BosNewsLife)-- Evangelical Christians in Burma say that the country's biggest non-state army is detaining some 100 pastors while conscripting Bible students into its ranks as fighters and destroying churches. YANGON, BURMA (BosNewsLife)-- A Burmese court has sentenced two ethnic Kachin Baptist pastors to prison terms for "supporting rebels and defaming the military" after they guided journalists around a church which was bombed by the Burmese military, trial observers told BosNewsLife. MELBOURNE/NAYPYIDAW (BosNewsLife Columns)-- On my blog some weeks ago I reprinted portions of a speech given in the Australian Parliament by a politician who had secretly travelled into a rebel-held region of Myanmar, also known as Burma. 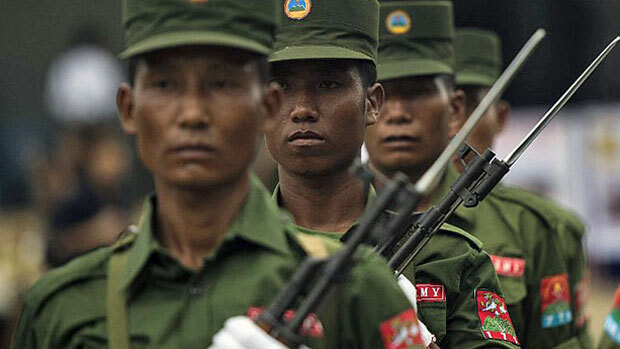 YANGON, BURMA (BosNewslife)-- Burma was under pressure Sunday, June 30, to halt violence against the predominantly Christian Kachin minority after at least two civilians were reportedly killed by government troops. Rights group Christian Solarity Worldwide (CSW) identified one of those killed as Zahkung Lum Hkawng, 45, who it said was "tortured, beaten and shot dead by the Burmese Army" in the Asian country's Northern Shan State on June 14. NAYPYIDAW, BURMA (BosNewsLife)-- Rights groups urged the world Friday, March 22, to pressure Burma to end a crackdown on ethnic and religious minorities after government troops reportedly killed and raped dozens of mainly Christian civilians while burning hundreds of churches and homes. NAYPYITAW, BURMA (BosNewsLife)-- Burma's government admitted Thursday, January 3, that the military is involved in airstrikes against the mainly Christian Kachin, a week after BosNewsLife and other media carried reports about a massive offensive in the north of the country. NAYPYIDAW, BURMA (BosNewsLife)-- A rights group urged Burma’s military on Friday, December 28, to immediately halt a major "offensive" against the mainly Christian Kachin people in the north of the Asian nation.